Adult scoliosis is defined as abnormal curvature of the spine in a patient over the age of eighteen. Sometimes this is the result of a childhood curvature that was left untreated and has since progressed. If scoliosis occurs in an adult with no history of a childhood curvature, it is classified as adult degenerative scoliosis. More often than not, adult scoliosis is caused by conditions such as osteoporosis or degenerative disease. Individuals with adult scoliosis have distinct differences in both their symptoms and treatment options when compared to pediatric or adolescent patients. A 71 year old female was diagnosed with degenerative scoliosis. Treated with minimally-invasive scoliosis correction. Adult scoliosis differs from adolescent scoliosis as the spinal curvature is commonly associated with back pain as the main presenting complaint. Curvature in the adult also tends to be severe and often progressive. The adult scoliosis deformity tends to be much less flexible, making treatment more complex. Advanced stages of degenerative disc disease may be associated with adult scoliosis and may be the primary cause of back pain for many patients. Pinched nerves from herniated discs and arthritis may also occur. Lower back pain and postural changes are hallmark signs of adult scoliosis. Pain is usually caused by degeneration of the spine, not the abnormal curvature; however, the degenerative process can be exacerbated by the scoliosis deformity, or vice versa. Treatment for the majority of individuals with adult scoliosis is non-operative. Such treatment may include exercise and conditioning, formal physical therapy and the use of non-steroidal anti-inflammatory medications such as Ibuprofen (Motrin). Nerve root blocks or epidural steroid injections may help to address leg pain occurring from pinched nerves in the lumbar spine. Bracing is seldom used for treatment of the adult patient but may be helpful for the elderly patient who is not an appropriate surgical candidate. Osteoporosis and osteopenia are treated with nutritional supplements such as calcium and vitamin D as well as with exercise. Surgery is generally indicated for patients with curves that have exhibited progression or worsening of the curvature over time and for those curves that are associated with pain that is unresponsive to other treatment, or that is associated with neurological symptoms. 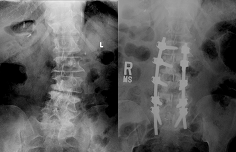 Severe spinal deformities may also be indicated for surgical treatment. Surgery in the adult patient may be performed from utilizing a range of surgical approaches and techniques. Dr. Stieber may also employ new, minimally-invasive techniques to treat some types of adult scoliosis. The period of recovery following adult scoliosis surgery can be variable depending on the character of the preoperative deformity, the complexity of surgery required and other patient factors. Patients may get back to full activities as quickly as three months after surgery, however others may require a substantially longer recovery process. Patients who choose to undergo adult scoliosis surgery can hope to experience a significant improvement in their spinal balance and overall quality of life with a return to an active lifestyle.